I never thought I'd have to Google the words "how to get rid of a skunk" until I bought a home in Burlington, Vermont, where the skunks seem to outnumber the humans. All summer, I have been researching and testing inventive ways to rid my property of this infamously stinky critter. Normally, I'm the live-and-let-helpless-animals-live type; however, when the stench became offensive enough to wake both my roommate and me in the middle of the night, it was time for Pepe le Pew to relocate. Before I launch in to my summer-long trials with eliminating my resident skunk, I would like to add one caveat — I had moments of desperation that clouded my ability to think logically, and after some sober reflection, I would not recommend employing some of the less dignified pest-control hacks, however entertaining they may be to the general audience. Having said that, there are safe, effective, and humane ways to get rid of a skunk. I tried them all, and eventually the skunk decided to move on. 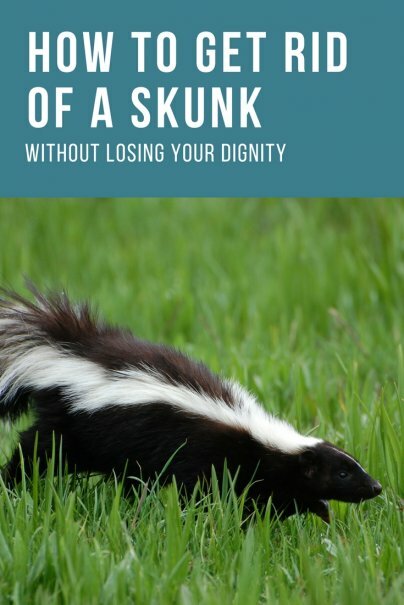 At first, it wasn't the undeniable musky odor wafting in through the open windows that clued me into the fact that I had a skunk problem; it was my yard. I started noticing small holes in the front yard, which I thought were dug by moles or some other burrowing creature. "You got yourself a skunk problem," my neighbor called out to me one day as I was bringing in the mail. "See those holes? Those are made by skunks digging for grubs." My neighbor then suggested that I kill the grubs with a pesticide that I could easily find at a local gardening supply store. The thought of killing hundreds of beetle larvae was a bit unnerving to me. What if I set off a chain of events that would disrupt the natural order of things, doing irrevocable harm to the animal kingdom? Plus it takes a long time for the stuff to work. I figured as long as the skunk wasn't harming anyone or anything, aside from ruining my lawn with dozens of pockmarks, then let him have his fill with grubs. But at some point in July, we started detecting the skunk's presence with olfactory cues. Night after night, the skunk was spraying somewhere near the shed in the back, and there were more grubbing holes in the backyard. Pepe had officially moved in. Upon discovering this, it wasn't surprising why Pepe had chosen to take up residence on my property. On one side of the shed I have a row of raspberry bushes and an apple tree, surrounded by a small area littered with fallen fruit. On the other side, there's a compost bin and a garbage can, and finally, two bird feeders a short distance across from the shed. I wasn't about to uproot my raspberry bushes or stop composting, and I am a passionate bird watcher. However, there were a few options that could minimize the attraction to these food sources, such as making sure the compost bin and garbage can have secure lids, and storing birdseed in chew-proof bins, which also prevents mice and other varmints from getting to it. But this was less than half the battle, since there were other attractive features about my backyard. When the skunk began spraying every night, I was afraid that he had made a nest somewhere inside the shed, since it is full of holes that I have neglected to repair. Then I read from several different reputable online sources that skunks are more likely to burrow underneath buildings than live inside of them. With a little investigating, I found the skunk sweet spot — a bare patch of yard tucked into the back corner of the shed where the wood is rotting at the base, right next to the raspberry bushes. Sure enough, something had dug a hole underneath the soft wood and, from what I could tell, had dug it out recently. The dirt was loose, and I hadn't noticed it before the smell became offensive enough to take action. My roommate had also begun researching ways to get rid of skunks, since his window is less than ten feet from the shed. He read a suggestion to put flour near the entrance to the hole and watch for tracks the next morning (skunks are nocturnal), or stuff leaves or other brush into the entrance of the hole, and later check to see if it had been moved to gain access. I went with the brush approach. The next morning, the leaves and sticks I stuffed into the hole had been dug out. At this point, I had the option of filling in the hole or blocking off the entrance. The problem is that this work has to be done at night, when the skunk is out, so that there's no risk of trapping the animal inside. I like to consider all possible scenarios when involved in such a delicate operation. What if he came back while I was on my knees filling in the hole? I did not want to risk getting sprayed. In addition, it takes a lot of work to ensure that the animal can't dig underneath whatever material is used to fill the hole. Many sites suggested digging down at least three feet and surrounding the opening with chicken wire. That would be hours of work while risking the skunk returning to his den (for more information on securing access sites, see the final section, My Recommendations). Lastly, there was the possibility that the skunk wasn't a "he." Female skunks will spray more often if they have kits in the nest. I didn't want to trap her babies inside while she was out getting food for them. Given all the possible scenarios and solutions that put me at risk for a skunk encounter, I decided that it was time to talk to a professional. I had only seen the skunk once, and although I didn't see any of those signs, I still couldn't live with the skunk's awful smell; however, I could not afford the pest removal quote on my shoestring budget. I asked the pest control representative if there was a possibility that another skunk would move in after the current resident was evicted. He said there's always that possibility, unless I took painstaking measures to ensure that there was no access to the shed or the house. So I asked if he had any other suggestions, and of course, he said I could try commercial repellants or live with the skunk. Living with that vile stench was not an option for me, so I continued my online research and looked up suggestions for repellants. The explanation behind the bar of soap fits one of the best examples of irony I have ever heard — skunks hate strong odors! I couldn't believe it, if only for the absurdity and cruel irony of it. But I was desperate. I also had a bunch of Yankee Candle votives someone had given to me as a gift. Personally, I cannot stand the smell of fabricated Vanilla or anything that has a name like "Christmas Memories," but I felt bad about tossing them since they were a gift. This was a perfect opportunity to use them for a good cause. I burned about six candles at once each night and turned on the lights in the shed hoping to "smoke him out." After a few nights of this, it became apparent that Pepe actually liked the combination of Sugared Plums and Bahama Breeze. I would've just set up my stereo in the shed and blasted some Ramones or White Stripes; however, I have neighbors with kids and a town noise ordinance to consider. Using a sprinkler would waste water, since I don't have a sprinkler system with motion sensors. I considered using coyote urine, but it is expensive and not that easy to find. Then, one morning at 2 a.m., when the smell woke me for the third time that week, I had one of my moments of desperation and tried something I would not suggest. I include it to demonstrate its ineffectiveness and, what I later learned, lack of humanity toward the skunk (see My Recommendations, below). In my research, I read that the ammonia in the coyote urine deters the skunk, not the fact that the coyote is one of the skunk's natural predators. In my hazy middle-of-the-night thinking, I deduced that it didn't matter what kind of urine is used. Ammonia is ammonia, whether it's from a coyote, dog, or human. I found an empty Diet Coke can and very carefully filled it with my own "contribution," then went outside to say au revoir to Pepe as I poured the contents around the entrance to the hole. Given the fact that I wasn't even considering the chance that I might wake up the creature and have a nasty encounter with it, I was clearly in no condition to make this choice without further research. My neighbor wrote: "I hear tell that skunks love ex-lax, but it makes them befoul their nest, and then, believe it or smoke it, they can't stand the smell. So they leave." I want to emphasize that while this method seemed to work ultimately, it is not a very humane way of getting rid of skunks (again, see My Recommendations). Before I tried it, I called another pest control company to ask about this method. The person I spoke with said, "I've haven't heard of that one, but hey, it can't hurt to try it." I also had to consider the fact that the excrement left behind would probably smell worse than the skunk's spray. Then again, the smell would also go away eventually, and the skunk would keep spraying if it continued to live rent-free under my shed. Then, there were the neighborhood cats to consider, and other animals who might also ingest the laxative. As I was weighing out the consequences versus the possible advantage of finally getting rid of the skunk and deterring future unwanted guests, I detected that familiar odor coming through an open window, as if it were a sign from God giving me my answer (or at least that's how I justified it). I was off to the drugstore. I didn't fully think through my purchase, however, because I bought the pills instead of the flavored chews. After placing a few pills strategically near the compost bin and at the hole's entrance, I recognized how ridiculous it was for me to think that a skunk would be attracted to some white pills that, from what I could tell, had no luring qualities other than the fact that they had been placed at his doorstep like a complimentary bedtime mint. In any case, the deed had been done, so I kept tabs on the bait. A few days went by, and they were still there, right where I left them. A few had started to break down, most likely from the moisture and the sun exposure, but all were mostly in tact, untouched by any critters that might have passed by. Just when I was about to give in and call the pest control to ask about payment plans, I noticed that one of the pills near the den was missing, and there was a milky substance in its place. Someone had taken the bait, and so that night I placed more brush in the entrance. A week later, the brush had still not been moved, and the smell had subsided. Just to be sure, I decided to wait a few more weeks before celebrating with a victory dance. I have not seen nor smelled a skunk in over a month. Eventually, I covered the hole with dirt and a few large landscaping bricks, and I haven't detected any signs of an attempt to dig underneath them. Although summer is ending, I am not completely in the clear. Skunks have a more urgent need for shelter during the winter months. So I continue to stand guard and pray that Pepe will remember his encounter with the crazy lady on Adams Court, and find another winter home. While the Ex-Lax seemed to work ultimately, I wouldn't recommend it if you are concerned about the animal's well-being. I also did not find the information at the Human Society about the inhumane use of coyote urine (or any urine) and pepper spray until after I had already tried the urine and laxatives. The site does not mention the use of laxatives as a deterrent, but I think it is safe to assume that the Humane Society would frown on it. Ex-Lax won't kill the animal (from what I know), but it isn't a very considerate way to remove it from your property. Also, if the skunk happens to be a rabid one, the laxative could complicate matters. My recommendation would be to first contact the local Wildlife Control to find out if they might remove the animal for free or if they have other suggestions. If you have the means, hire a reputable Pest Control Agency to remove it. I wouldn't recommend removing it yourself, and not just because of the risk of the animal spraying you; a rabid animal is not something you want to mess with. Additionally, if you live in a place with a high skunk population, there will be more skunks to take its place unless you take measures to secure any access to ideal den sites. If you see any suspicious holes that appear to be large enough for a skunk to live in, I would fill it in once the animal has been removed. For more information on preventative measures, visit the Human Society's page on creating protection for your home and outbuildings. Mix these together and bathe ("shampoo" in or rub down) the spray victim thoroughly. Be sure to use this mixture immediately after it is created, as it is unstable. Rinse with tap water afterward, and repeat if necessary. *For spray in the eyes, flush with water as soon as possible. Something I read when looking to remove the groundhog that resides under my porch . . . when fencing off an area, you don't have to dig down and bury the fence. If you set up the fence in an L-shape, with enough extending out, the animal simply cannot dig down far enough to get under. Also, if you are concerned about trapping an animal in its den or separating a mother from young, you can create a flap in the fence that only swings outward. In that manner, you create a one-way exit that allows an animal to leave but not return. If employing this method, I'd hold off fencing until the young would be old enough to exit without mamma's help. Just a suggestion for anyone else coming along. We recently discovered that there was a skunk living under our neighbors shed, we suspected it last year but could not confirm it. However, last night we had the unfortunate incident of our dog chasing the skunk and the skunk spraying. The dog didn't get hit with the spray but the house was pretty stinky. I will definitely pass on your tips to our neighbor, except perhaps the exlax and the urine. I am not sure how my neighbor would react. Thanks for sharing your experience, not only did I get useful information but I was definitely amused! Hydrogen peroxide can make you blind if it gets in your eyes!!!!! That is why they say to use water in your eyes not the peroxide concoction. I just got rid of a skunk in my crawl space. He had been in there for one week. Unfortunately his nest was in the very back corner of my crawl space. I tried several different remedies from soaked cayenne pepper, Paprika rags to ammonia. This had little effect. I then placed two flood lights near the nest, 8ft or so. I place two traps in the shadows away from the light. I use bacon for bait. The next morning when i crawl up in there to check he was in the first trap. My problem now was getting him out without getting sprayed. I put towels over the cage so he could not see me. I picked up the cage an very carefully crawled out of the crawl space. I released him into the woods but repaired the vent where he got in before his release. Hope this helps. That's pretty brave Mike! Where I live animal control won't do anything... What if there rabid and some child gets bitten? Living in a large city you would think they would be willing to help considering we pay their salaries through property taxes!! !